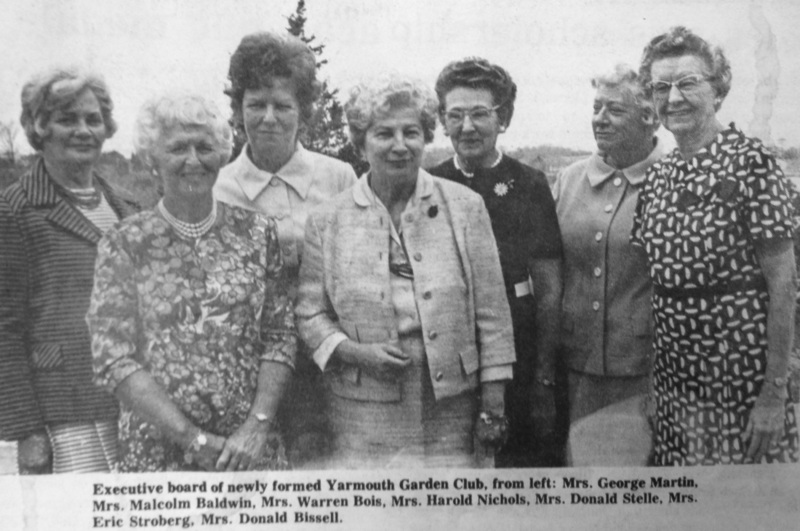 In the winter of 1971-72, a number of Yarmouth women, some of whom had garden club experience, joined together and in March 1972 they held the organizational meeting of The Garden Club of Yarmouth at the Yarmouth Town Hall. The founders' objectives, which we continue to follow today, were to stimulate interest in gardening and conservation, and to cooperate with town officials to further beautification of the Town of Yarmouth. The Cape Cod Standard Times and The Register reported on the formation of the club and the election of its first officers: Mrs. Warren Bois (later Mrs. Samuel H. Schuman), President; Mrs. Harold Nichols, First Vice President; Mrs. Malcolm Baldwin, Second Vice President; Mrs. Donald Bissell, Treasurer; Mrs. Donald E. Stelle, Assistant Treasurer; Mrs. George E. Martin, Recording Secretary; Mrs. Eric Stroberg, Corresponding Secretary; and Miss Margaret Boland, Historian.